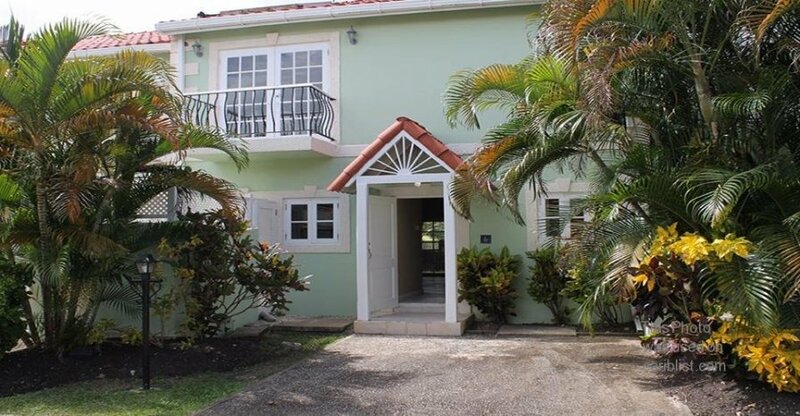 Located in the lovely Parish of St James, on the famous platinum West Coast of Barbados. The development known as 'Porters Gate' is a private, tranquil gated community (electronic security gates) and consists of 28 townhouses, set in spacious surroundings adorned with local shrubs, colourful planting and swaying palm trees . There is a sociable shared swimming pool, tennis-court & club-house. Nestled in a quiet area around a 6-8 minute walk from the nearest beach & only 2 minutes walk to Highway 1 for buses to Holetown (1 mile) where you will find many shops / supermarkets / banks & restaurants. Our house, 'Palm View' is a beautifully presented modern 3-bed/3.5 bath townhouse built around 2005. The house has been tastefully furnished with locally produced furniture and comprises in brief: 3 en-suite bedrooms all with private balconies, downstairs w/c, open plan kitchen, living & dining room and rear covered terrace/dining area & garden beyond. Free (private) Wifi throughout the house for keeping in touch whilst in paradise! Our lovely modern kitchen is well equipped with everything you could need for a self catering holiday including; kettle, toaster, microwave, coffee maker, smoothie maker, oven, hob, dishwasher, washing machine, large fridge freezer with ice maker and plentiful plates, dishes and glasses for a pre-dinner rum punch! Beautiful granite worktops are throughout and form a fabulous breakfast bar for informal eating. Through to the dining area there is a ceiling fan to keep you cool in the evenings with a dining table & chairs for 6 people.. From here you can open the french doors which lead out onto the large covered terrace where you can enjoy al fresco dining or why not get comfy in 'kindle corner' a perfect spot for curling up with your kindle & a cold Banks beer whilst listening to the birds, watching the green monkeys or spotting the beautiful hummingbirds which visit our lovely garden. Back into the living area, there is a sofa and 2 chairs for sitting back, relaxing and catching up on the news from home! This area also benefits from a ceiling fan. We have a brilliant TV system with all UK/US/Canadian/Sport channels as well as a great selection of movies to watch. And finally for your convenience, there is a downstairs powder room & an understairs cupboard housing iron / ironing board and other useful items. As you ascend the wooden staircase you will look up to see a wonderful vaulted ceiling - one of my favourite aspects of this house! There are 3 bedrooms; bedroom 1 at the top of the stairs has 2 single beds (can be pushed together if needed) fitted wardrobes with full length hanging & plentiful shelving. The en-suite shower room has a very large walk in shower, w/c & vanity unit. There are french doors which open onto a private balcony overlooking the tennis court & swimming pool beyond, with a lovely little view inland too! There is air conditioning & a ceiling fan for your comfort. Bedroom 2 at the rear of the property also has twin beds which can come together if needed, it has fully fitted wardrobes and shelving for 2 & a lovely en-suite with an impressive vaulted ceiling! The balcony from this room overlooks the rear garden & trees beyond. This bedroom also benefits from air conditioning & a ceiling fan. The master bedroom is a great size and has a (UK) king size bed (or a US queen size) and again ample wardrobe space for 2 with full height hanging & lots of shelving. With another wonderful vaulted ceiling this is my favourite room... the en-suite is huge and has a twin vanity unit, large whirpool/jacuzzi bath tub with shower & w/c. The master bedroom has air conditioning & a ceiling fan and the balcony overlooks the rear garden & trees beyond. We also have a large electronic safe should you wish to store your valuables during your holiday. In an effort to make your stay as 'green' as possible, we ask that you please respect our efforts to keep electricity usage at a minimum. We still expect you to use all you need for your comfort, we just want to ensure that all a/c units / ceiling fans and lights are not left on all day when you are away from the property. To try and ensure this does not happen, we will require an additional electricity deposit of £150 which we reserve the right to retain part / all of if we deem your electricity usage to be considerably above the norm. Please take a meter reading on arrival & departure (more info upon booking). it is precautionary, we hope you understand! Flexible changeover day. We will always do our best to accommodate you!